How Is This Cooking Different? and become empowered with hundreds of new meal ideas for any diet in just minutes! 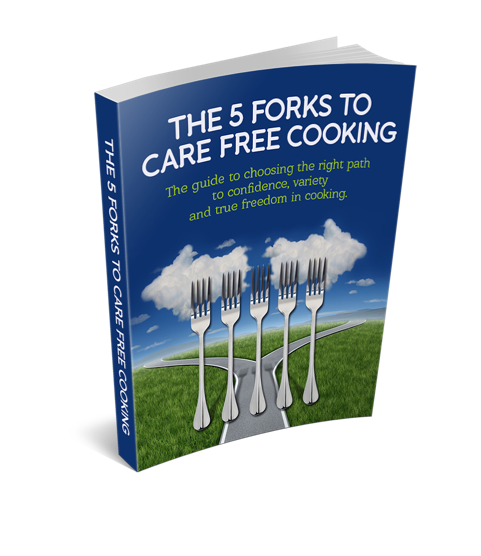 Become a Care Free Cook! Realize that you’ve been taught to cook all wrong and how you can change immediately. Web Cooking Classes has eliminated the expense of cooking with recipes from my life. I now have confidence in my cooking, ability to think beyond the recipe and the skills to focus on cooking with what we have in the house, which is a big money saver. I've been telling friends about the fun that cooking has become through structured success--and through freedom from recipes. Where have you been all my life?” I am enjoying this so much and you are an awesome teacher. You give me the knowledge I need to become so much better and understand what I'm doing. You teach from the heart and I can tell that you love it as much as I do. You make learning fun and teach it in a way that you remember it. I love these on line classes as there is no pressure and time line. I watch the videos over and over again. I'm the most unlikely guy to ever be taking a cooking course, I used to feel stressed and tight in the kitchen unless I was doing the dishes. I couldn't have been more shocked how quickly I wanted to be in the kitchen to cook! I have cooked several times a week. The gained confidence is making me more excited and my family can trust me more now, how cool is that!!! I am at best a self taught home cook, I do currently work at a non profit organization as a cook, it's all homestyle cooking. Thanks to Chef Todd I am learning new skills, becoming more knowledgeable in the kitchen and upping my game. This course has dramatically increased my confidence, inspiration and ability in the kitchen. The lessons are brief and entertaining. Chef Todd is an exceptional teacher. I've signed up for the lifetime membership and glad I did. If you're considering this I'd highly recommend it. I started cooking when I was 12 years old. I am not looking to become a professional chef, I am doing this for my family and myself. These courses will allow me to prepare quality, wholesome food at a fraction of the cost you would pay someone else. I have control of the ingredients as well as the process. I highly recommend this series of classes, I promise you won't regret it. I have now finished the first Module of Chef Todd's cooking classes and before I started I thought I knew most things as I have been cooking forever. Well was I wrong...I have learned so much more and can now put my own recipes together which is half the fun. This has been the most wonderful course I have ever taken and would recommend it to everyone as he has so much information to offer. At first I was intimidated by the type of cooking he was demonstrating but the first week I was able to overcome my fears and succeed where I thought I would fail. It has been a boost to my confidence and a boon to my pocketbook and diet. I had always been envious of people that could throw anything in a pan and make it taste good, but now I AM one of those people. After 50+ years of cooking, I still did not have the building blocks for making my own dishes. Chef Todd has been changing that week by week. My first attempt at creating a recipe that was truly "all mine" was a smashing success! What I've saved in wasted food costs alone, makes this course worth the investment. But, the fact that I'm learning to create my own delicious recipes takes it off the charts! I love that it's so easy & fits into my busy schedule. Each lesson I look forward to building new skills & I really can't wait to see what I will be able to do by course end. My family is really impressed. I just can't say enough. Thank You Chef Todd!!! I Don't Just Teach Cooking by Method...I Live It Everyday. When home cooks discover the dependable, repeatable, reliable METHODS in cooking, this builds confidence. With confidence comes creativity, and that’s when they are truly Care Free and cook the way THEY want with the foods THEY desire. We respect your privacy. You can unsubscribe from our email list anytime from any email. We will not share your information with anyone.